Mohandas Karamchand Gandhi was a young man of 24 when he arrived in South Africa in 1893. 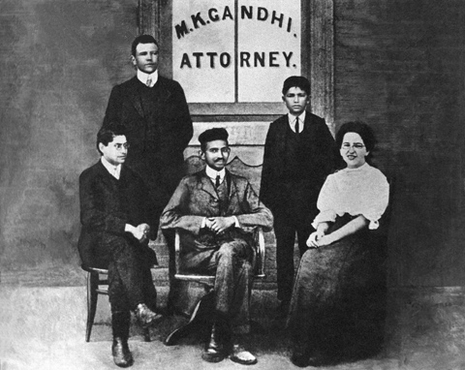 Gandhi's work in South Africa dramatically changed him, as he faced the discrimination commonly directed at black South Africans and Indians. One day in court at Durban, the magistrate asked him to remove his turban. He was thrown off a train at Standerton, in the Transvaal, after refusing to move from the first class to a third class coach while holding a valid first class ticket. Traveling further on by stagecoach, he suffered other hardships on the journey as well, including being barred from many hotels. These incidents have been acknowledged by several biographers as a turning point in his life, explaining his later social activism. It was through witnessing firsthand the racism, prejudice and injustice against Indians in South Africa that Gandhi started to question his people's status, and his own place in society. However, these events by no means explain why he advocated non-violence instead of aggressive revolution. he straits to which he had been reduced [in Rajkot, India] may be surmised from the fact that he applied and was turned down for a part time job as a teacher in a Bombay high school with the modest salary of seventy rupees (£5 1/2) a month. It was with some relief that he discovered that he had a flair for drafting memorials and petitions. He wound up his little establishment in Bombay and returned to Rajkot where petition- writing brought him an income of three hundred rupees a month. He might have settled down as a barrister scribe if he had not incurred the displeasure of the British Political Agent in Rajkot in whose court most of his work lay. So, when an offer of a job came to him from South Africa, he gladly accepted it. The contract was for a year in connection with a civil suit; the remuneration was £105, a first-class return fare and actual expenses. The fee was modest and it was not quite clear whether he was engaged as counsel or as a clerk, but he was in no position to pick and choose. He could hardly have imagined the new vistas of maturity and public service which the South African adventure was to open to him.